I’ve often heard, “When you win, win with grace. When you lose, act like a winner.” That sounds somewhat similar to “Whatever happens, conduct yourself in a manner worthy of the Gospel of Christ” (Phil 1:27). I do have a one thought about the election… CLICK HERE. 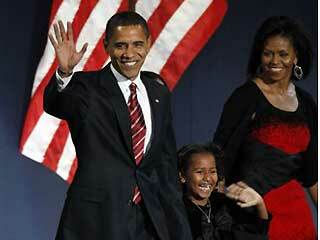 Barack Obama deserves congratulations! He has accomplished a great thing in being elected the president of the most powerful nation in the world. America has elected the leader she wants and will be given her desire for at least the next four years… as God wills. Render to Caesar what is Caesars and unto God what is God’s. Christians are to pray for our leaders so that we can live lives of peace and tranquility. That would mean we pray for President elect Obama, Vice-president elect Biden, Congress, and all those who govern us. All Christians are to honor President elect Obama, for this is good in God’s sight. All Christians are to pray for President elect Obama, for this is good in God’s sight. All Christians are to obey the laws that President elect Obama might implement, unless they conflict with the laws of God. Only then do we disobey (Ac 5:29)… and then accept quietly the result. President elect Obama needs to remember that the reason he is president is because God placed him in that position (Ro 13:1b, “For there is no authority except from God, and those that exist have been instituted by God.”). President elect Obama needs to keep close to his heart that he is God’s servant (Deacon) for good and not for evil (Ro 13:4a). To resist the government is to resist God (Ro 13:2). With that said… America turns a page in her history. Wednesday is a time for congratulations… a time for affirmation… a time for prayer… a time for pause and reflection. Consider a blog I wrote where I made predictions about the election two days ago. I still hold firm to what I wrote! Click here to read. In the coming days, weeks, months, and years we will see whether it will be said of President elect Obama… as it was said of the Judges in Israel… “He did what was right in the eyes of God“ or “He did not do what was right in the eyes of God.” My prayer is that it will be the former, not the latter. I will also pray that I will have the strength to do as God has instructed on how we, as Christians, should relate to our political leaders given the kind of man that we know Obama to be. I will admit that this will be tough for me. I will certainly pray for the protection of our nation, not just because of nation security issues, but moral issues especially. In the history of the world, most if not all, great nations and great civilizations have gone down this same path. None that I can think of have made it. This will require a lot of prayer. I thought it was certainly telling that there were celebrations last night in Iran, Iraq, Russia, and other nations that are hostile to the US. Last night on the internet, I read the transcript of a sermon by Pastor Tim Keller that was titled “The Hiddenness of God” and it gave me encouragement that God is working for our good even when he seems to be absent. I, too, will pray for our country and all it leaders and for peace and tranquility. God is Great! God is Love! God is in control!